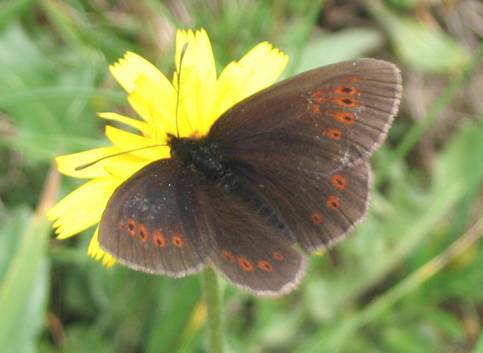 The Mountain Ringlet is a small Erebia with rather angular, slender, pointed forewings. There are several subspecies described and the butterfly seems quite prone to variation in the markings. The individual above from the Alps, which was flying at 2300m, has nice, minutely pupilled eyespots and a shiny orange sheen across the shoulders; features which may be more associated with females. 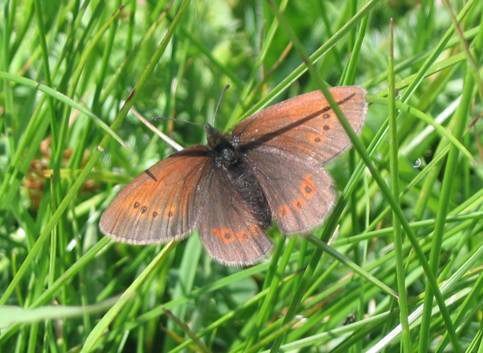 The butterfly from the Pyrenees has ocelli which are clearly blind and the ground colour is uniformly brown. Lovely!